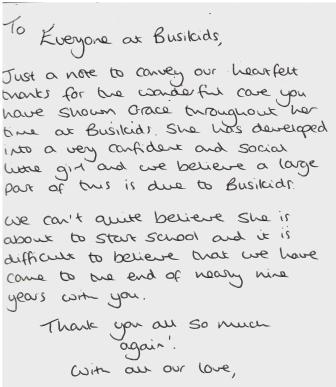 Ages and Stages | Busikids childcare nursery, Hedge End, Southampton, Hants. We have four main indoor areas within the Nursery, all specially equipped for the different aged children - each play room has a dedicated carpeted area, an area of waterproof flooring - ideal for meal-times and creative/table top activities, plus a quiet area with floor cushions for cuddles, stories and rest times. There is also plenty of open space for construction activities, dancing and playing. This is situated upstairs and this is where we care for our babies aged from 3 months to around about 17 months, depending upon each individual child's needs and development. Please follow the link for much more information. This is a lovely area where we care for our older babies who are generally now toddling. They will be aged from around 17 months to 24 months old. Our Monkey Play Room is right in the middle of the house downstairs and is ideal for easy access to the outside. This is where we care for all our 2-3-year-old children. Our children have a large dedicated space here, with their own entrance and plenty of access to the outside, children are aged from 3 to nearly 5 when they are ready to go to Big School.